I have a bug out in the woods but my main residence is in an urban environment. I have been trying to figure out the best way to carry spare mags for a fighting rifle for a while. This is where I am at as of today, subject to change. I think the thought of carrying a rifle and mags falls into two trains of thought. One, it’s a get out of dodge / bug out scenario or two, it’s a SHTF situation. In a bug out scenario with a rifle, I think that something that can be tossed on quickly that is low profile / covert in nature and has medical and mags (pistol & rifle) is the way to go. This could be a bag, battle belt, or chest rig. I have a battle belt from Viking Tactical that I use for rifle classes. I love the belt but it’s slightly bulky and I don’t think you will be moving around town unnoticed with it on. I am of the opinion that the same goes for a chest rig, although slightly more concealable then the belt with a cover garment. 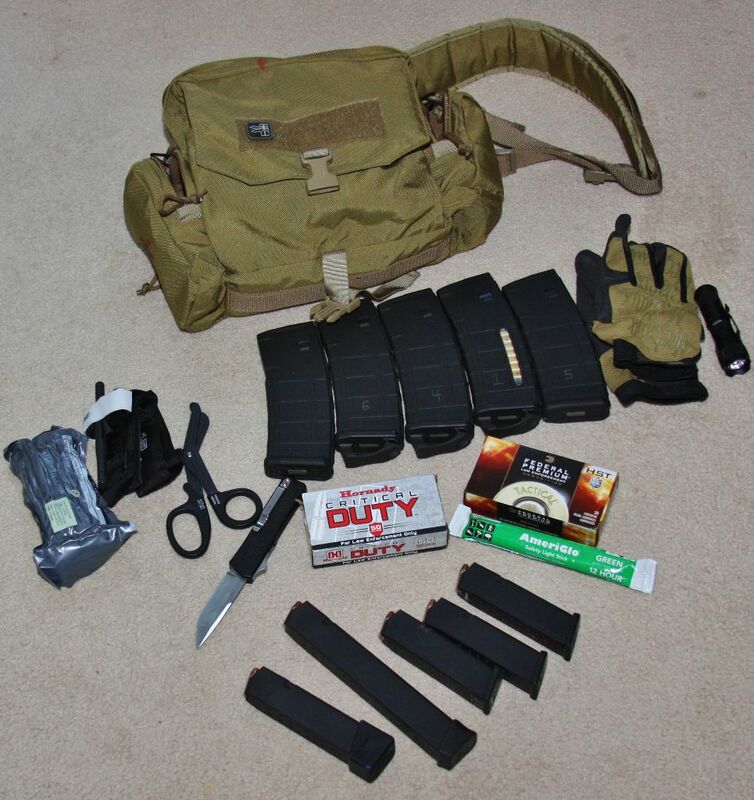 In my humble opinion, the battle belt / chest rig / plate carrier are better suited for a total SHTF / without rule of law situation vs getting out of town unnoticed. So that leaves us with two options that I have found. One is the Raven Concealment ModuLoader Frames (review on the way) which are a low profile way to strap HSGI Taco pouches to you belt and the second is a dedicated bag. The RC ModuLoader is awesome piece of kit but you are slightly limited to what you can carry; 2 or 3 rifle mags and a pistol mag. They are somewhat easy-on depending if you get the paddle attachment vs belt loops but not something I would want to do under stress. That brings us to a dedicated bag. There are a lot of them on the market from Maxpedition to Blackhawk and everywhere in between. 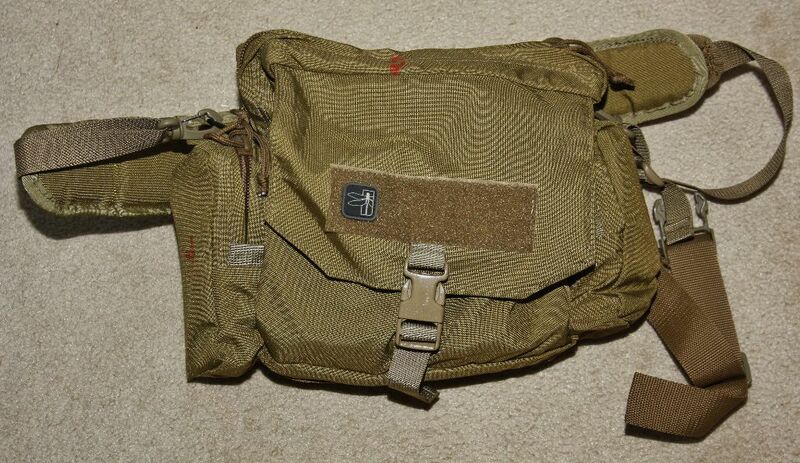 I have looked at more than a few and I always come back to One Source Tactical’s Terrorist Interdiction Bag or TIB. It is very low key bag that you could throw in your closet or push under your desk and I’m sure the guys at OST intended it to be that way. You could easily carry it through downtown Chicago without issue. 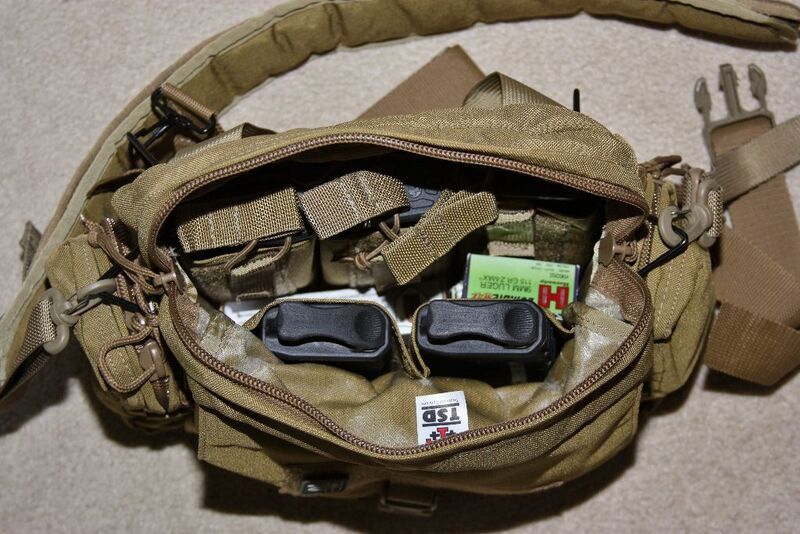 The TIB is essentially a messenger bag with 4 pockets; one large pocket for rifle mags and a pistol, two side panels that can fit medical gear and odds and ends and a front pocket that holds pistol mags. The bag has a grab handle, a messenger style shoulder strap and a strap with a fast buckle that can wrap around your waist if you need to move quickly. Once dialed in, the bag can be locked up very secure to your body or worn loose like a messenger bag. The main pocket of the TIB can easily hold 6 rifle mags, AK or AR along with storage for additional ammo (I have a couple 50 round boxes of pistol ammo in there). 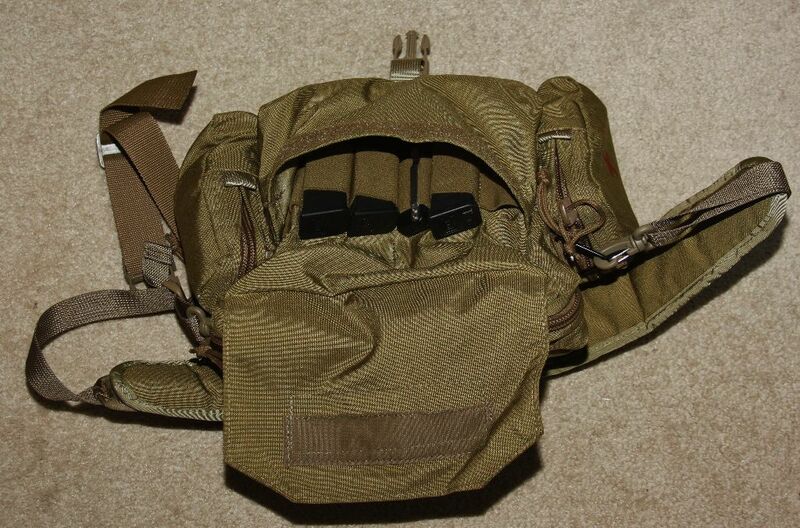 3 of the mag pouches have bungee straps for mag retention and two do not. There is also a hook & loop back panel for a pistol holster like the Maxpedition Universal CCW Holster. It is a simple clam shell opening with quality YKK zippers with a pull tie. It could easily be used as a dump pouch if needed. The two side compartments are just open vessels. I have med gear in one with a tourniquet, medical scissors, and an Israeli battle dressing. On the other side I have a pair of gloves, flashlight and extra batteries. The front pouch has a hook & loop flap along with a fast buckle. 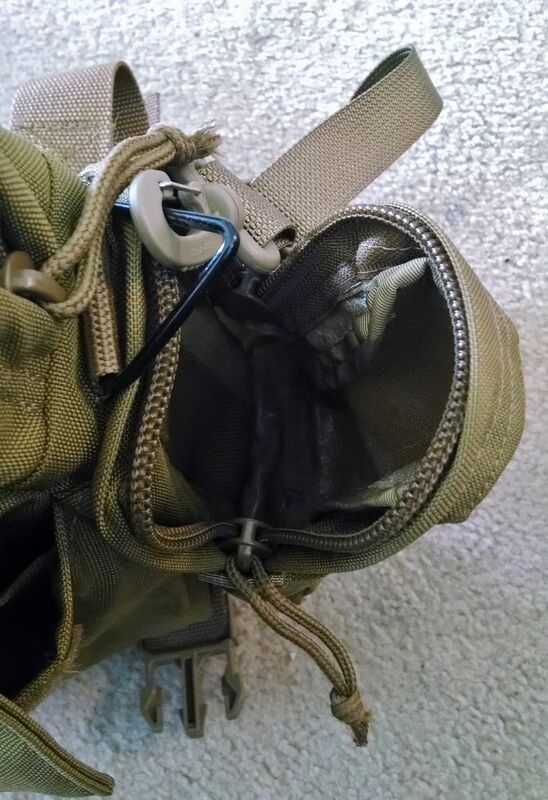 The pocket has elastic bands for 6 pistol mags that can accommodate 30 round GLOCK 18 mags. The bands are also excellent for storing a knife. The bag fully fulfills my requirements as an all in one emergency get out of dodge bag. As mentioned before, it is great to have in a closet or under a desk. It would also be at home in a trunk of a car or in the tool box of a pickup. It is low key and there is no way a civi would know what it is. The bag can be used to hall gear but also as a dump pouch, meaning you could easily fight with this bag. There are many over at the Warrior Talk forum that have done rifle classes with the TIB without issue. I purchased the coyote tan but I think the black is probably a better low key option. All the stitching, zippers, and attachment points are excellent. This bag and stitching will have no issue with over loading it or weighing it down. The only flaw I could find with the TIB is the shoulder strap. The strap it comes with is fine but when you get the bag loaded up (mine weight in at about 15lb) it has a tendency to cut into your shoulder. I just grabbed a padded strap from another bag and now it’s perfect. For the cost I think it’s a non-issue, and at $65 I think the TIB is a steal. If you are looking for a discreet bag to carry the basics to get the hell out of town with a rifle, for the money the One Source Tactical’s Terrorist Interdiction Bag (TIB) can’t be beat.